Coach Divine Interviews Robb Wolf, author of The Paleo Solution – Visit Robb Wolf’s site to read his bio and to read more about “The Paleo Solution”. The Unbeatable Mind Academy hosts monthly interviews with Subject Matter Experts as one of the many features of UMA. 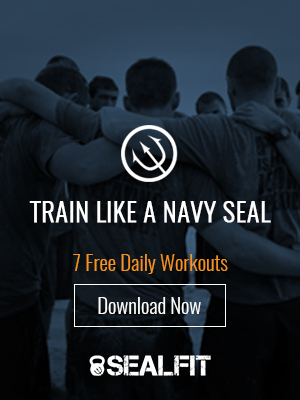 This was such an incredible interview I have decided to share it with the entire SEALFIT community. Enjoy…. Truer words are hard to find. We’d like to equate courage with fearlessness. Certainly those big tough Navy SEALs don’t experience fear in combat or on a night jump do they? Yes, they do. But what separates the courageous from the cowering is a deep understanding of human nature, coupled with disciplined practice of skills that mitigates the fear response. When the fear response is mitigated, focus and composure can be maintained in the face of extreme stress. In essence, we can turn stress into success! In our Unbeatable Mind and SEALFIT programs we seek to do just that. Through a disciplined practice of breath control, visualization, short term goal setting, positive self-talk, and training like we “fight”, the students cultivate what appears as courage to the observer. Inside it is simply fear management and performance under extreme stress. One of our powerful mental toughness tools is to collapse our goals to the near term. I call these micro-goals. Focusing on getting to the next meal at BUD/s is a micro-goal. It works, trust me. Jeff says to “think small” and take bite size chunks in crisis. This is great advice! “If you’re bogged down in a massive project at work, then, don’t let yourself despair at the hugeness of the task. Break it down into pieces small enough that you can do each one in an hour or less, and focus all your attention exclusively on that”, says Mr. Wise. When we set our sights on micro-goals, we achieve micro wins, which quickly stack up and develop a sense of momentum and “can-do” instead of “can’t – won’t.” Micro goals support the cultivation of courage. Macro goals can lead to fear and failure. Transmuting the emotion of fear into anger can be a powerful tool in a crisis situation. Anger can be very motivating and really get your psychic energy amped up. Then you direct it at the problem and voila – looks a lot like courage. This principle certainly works but I caution you to use this sparingly. I think we can easily go too far with this one. Be careful to not let it get out of control and negatively influence your decision making. However, I am certainly not recommending a passive response. A non-violent response to a serious injustice, such as a Buddhist monk may have, could lead to serious issues, even death. That is not the warrior’s path. I would prefer that we explore developing strong but positive emotional states that are even more powerful than anger. In a pinch, anger is a powerful emotion that can trample fear. This is one of my favorite. Jeff hit the nail on the head here. I believe that regardless of the situation we are in, we can find beauty in the sublime nature of it. By letting go, collapsing our focus to the present and releasing the need to control the outcome, we can transcend into a flow state and enjoy the ride. Let’s take Kokoro camp as an example. Many graduates have expressed having a spiritual peak moment at 5am, after being up for countless hours of brutal training – watching the sun rise. They experience a sense of sublime wonder at the beauty around them, in spite of their exhaustion, cold and dire circumstances. Smile if you have been there! Thank you Mr. Wise for your insights – we hope to see you at SEALFIT in the near future! Reminder that Kokoro graduates receive a 50% discount on Warrior Yoga, Combat Defense, and if you are courageous, a second round of Kokoro! We want you to come back and continue your training. Contact [email protected] if you are interested. Unbeatable Mind Academy continues to grow and spin out amazing testimonials. Consider joining us on this journey if you are not able to come to HQ this year. Platinum members receive direct coaching and free attendance at the UM Warrior Summit. Announcing the Unbeatable Mind Warrior Summit! This is a two day summit to be held in San Diego on November 10th and 11th, followed by our first weeklong Warrior Yoga Academy. Save the date and await further information. Next SEALFIT 1 Week Academy is April 16th followed by Kokoro 22 on April 22. Please enroll soon as space in the Academy is running out.